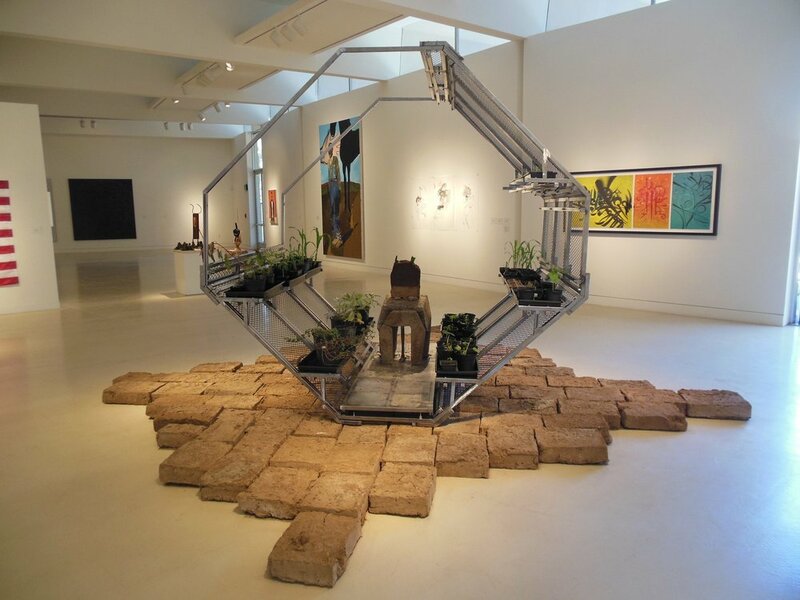 Studio Systems II - "Anything But Typical"
The Torrance Art Museum is hosting the group residency project Studio Systems II, which brings the dynamics of the artists' studio into the Museum. 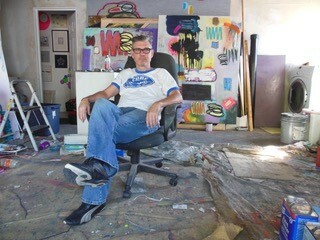 The main gallery at TAM is divided into studio spaces for 13 artists. The artists will be working in the museum studio spaces all month long on a piece for exhibit in the Museum while they interact with visitors. Studio Systems II, the artists’ residency program happening this month at the Torrance Art Museum, is anything but typical. When visitors enter the main gallery, they are met with the smell of hay, paint and tea, scents of simultaneous art works in progress. At least a half dozen artists are creating in their spaces, sometimes gathering at a table full of food and drinks in the center of the room when they want a quick break. 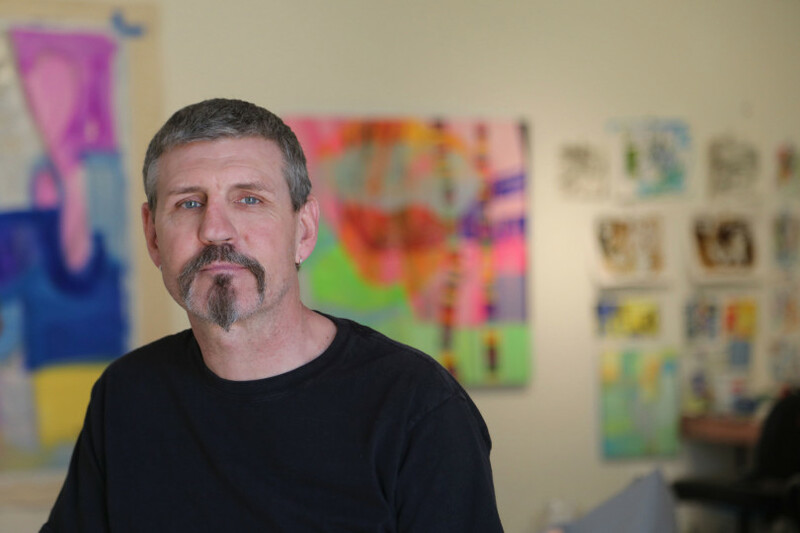 That organic, creative interaction among artists and the public was what head curator and museum director Max Presneill envisioned when he first conceptualized Studio Systems more than three years ago. Each artist had to submit a proposal and chosen artists receive a stipend and free space in the main gallery to create their art during open museum hours. At the end of the program on June 30, there will be a closing ceremony where everything the artists made will be presented to the public. This year’s Studio Systems II, which will run until June 30, features 13 artists who create in various art forms from performance art and photography to paint and sculpture. 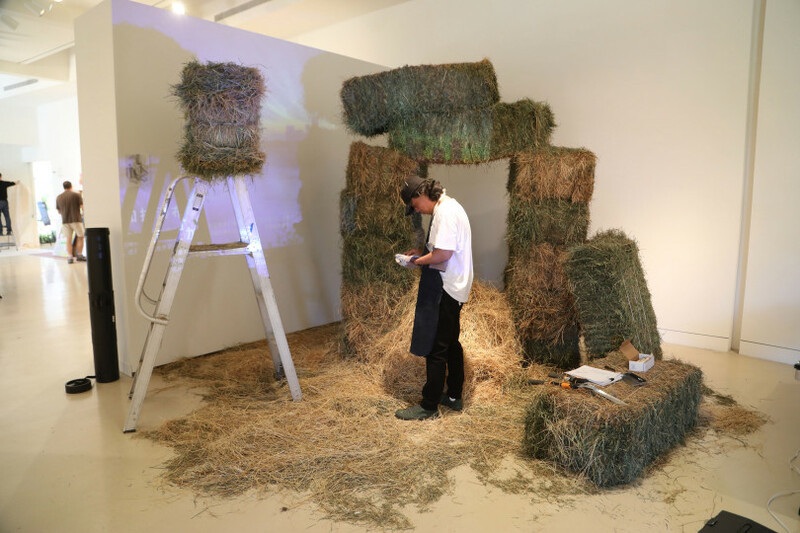 In one corner of the gallery, artist Huo You Feng is shaping 15 pounds of hay with shears. In another corner, artist Feng Ling is conducting a performance art centered around the tradition of drinking tea. The program is especially advantageous for Bonassi, whose works are shaped by interaction. The program also features artists Chenhung Chen, Tom Dunn, Anna Garner, Lawrence Gipe, Debby and Larry Kline, Hagop Najarian, Khang Nguyen, Samuelle Richardson and Tyler Waxman. 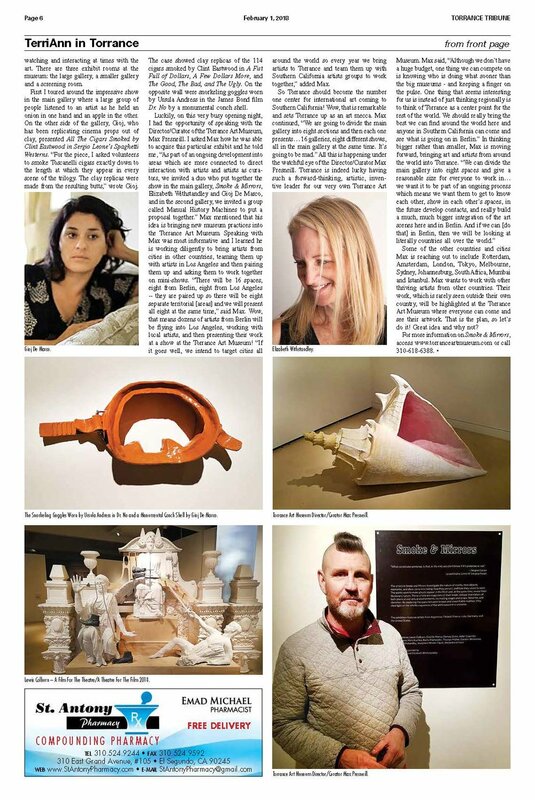 The Torrance Art Museum's first exhibition of 2018, Smoke & Mirrors, made front page news in the Torrance Tribune! 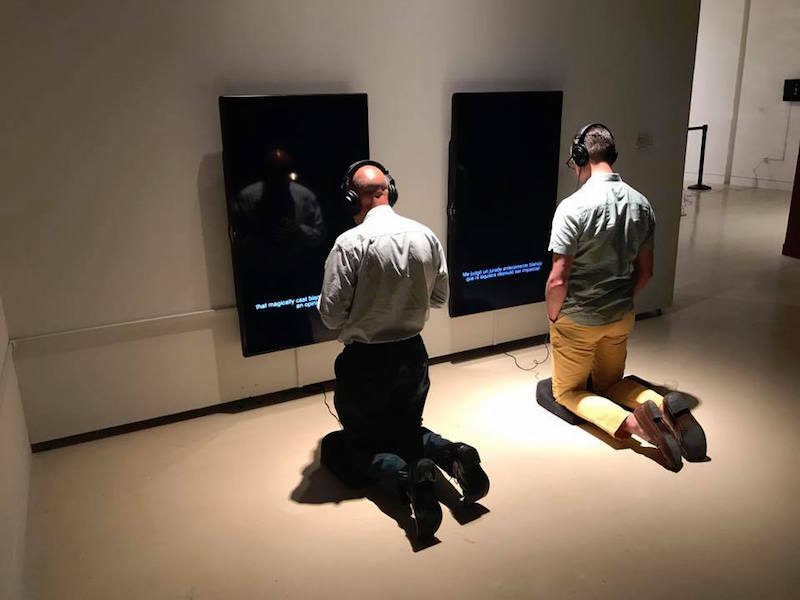 Two new exhibits at the Torrance Art Museum, Smoke & Mirrors, curated by Gioj De Marco and Elizabeth Withstandley, and Solar Flare, curated by Manual History Machines, opened Saturday, Jan. 20 and runs until Saturday, March 10. Featured artists include Adler Guerrier, Alejandra Urresti, Barry Markowitz, Bettina Khano, Clifton Childree, Dorsey Dunn, Elizabeth Withstandley, Gioj De March, Gordon Winiemko, Heta Kuchka, Joséphine Wister Faure, Lewis Colburn and Thomas Müller. “The artists in Smoke & Mirrors investigate the nature of reality; how objects, memories, and ideas come into being; how they persist; and how they cease to exist,” the description of the program reads. Special events planned for later in the show run include Levitation and BMT-IRT-IND, performances by Joséphine Wister Faure and Barry Markowitz on Feb. 10 from 2p.m. to 5 p.m. and on March 3 from 3 p.m. to 5 p.m. Also don’t miss the MAGICAL EXPERIMENTS OR SCIENCE IN PLAY, a moderated panel discussion with the artists. I spoke with Gioj De Marco and Elizabeth Withstandley, the two curators of Smoke & Mirrors. “We came together in a funny way,” said Elizabeth. “We started a not-for-profit space in Miami called Locust Projects and a few years ago we had done an open call and there was 350 artists that had sent in proposals. So I was one of the people going through the proposals and getting them ready for the committee that was going to review them…and you know you have [only] a few slots available – way more artists than you can do things with. But there were a few proposals that I really enjoyed that I felt I needed to reach out to these artists and say, ‘I am sorry -- you’re not having a show at Locust Project, but I really enjoyed your work.’ Through that I sent Gioj one of those emails.” The two artists met, connected and realized their work dovetailed beautifully together, so they looked for other artists who would fit in their genre. “How the work connects is that we were both working parallel with the notion with cinema and objects in film,” said Gioj. “At the time, Elizabeth was photographing props in prop houses and then writing imaginary scripts about it and presenting them as photographs. So that was such a clear, esthetic and conceptional connection. That it was also wonderful for me to receive news that I was not alone in my thinking. So we had this real artist experience.” These two talented women both live in Southern California and have come together for this and other projects. The two have reached out to artists in Los Angeles, Florida, Argentina, Finland and Germany and feel as if this is the first attempt at the conceptional organization of the work. The Smoke & Mirrors grand opening was a huge success. People were crowded into the museum perusing, studying, reading, watching and interacting at times with the art. There are three exhibit rooms at the museum: the large gallery, a smaller gallery and a screening room. First I toured around the impressive show in the main gallery where a large group of people listened to an artist as he held an onion in one hand and an apple in the other. On the other side of the gallery, Gioj, who has been replicating cinema props out of clay, presented All The Cigars Smoked by Clint Eastwood in Sergio Leone’s Spaghetti Westerns. “For the piece, I asked volunteers to smoke Toscanelli cigars exactly down to the length at which they appear in every scene of the trilogy. The clay replicas were made from the resulting butts,” wrote Gioj. The case showed clay replicas of the 114 cigars smoked by Clint Eastwood in A Fist Full of Dollars, A Few Dollars More, and The Good, The Bad, and The Ugly. On the opposite wall were snorkeling goggles worn by Ursula Andress in the James Bond film Dr. No by a monumental conch shell. Luckily, on this very busy opening night, I had the opportunity of speaking with the Director/Curator of the Torrance Art Museum, Max Presneill. I asked Max how he was able to acquire this particular exhibit and he told me, “As part of an ongoing development into areas which are more connected to direct interaction with artists and artists as curators, we invited a duo who put together the show in the main gallery, Smoke & Mirrors, Elizabeth Withstandley and Gioj De Marco, and in the second gallery, we invited a group called Manual History Machines to put a proposal together.” Max mentioned that his idea is bringing new museum practices into the Torrance Art Museum. Speaking with Max was most informative and I learned he is working diligently to bring artists from cities in other countries, teaming them up with artists in Los Angeles and then pairing them up and asking them to work together on mini-shows. “There will be 16 spaces, eight from Berlin, eight from Los Angeles -- they are paired up so there will be eight separate territorial [areas] and we will present all eight at the same time,” said Max. Wow, that means dozens of artists from Berlin will be flying into Los Angeles, working with local artists, and then presenting their work at a show at the Torrance Art Museum! “If it goes well, we intend to target cities all around the world so every year we bring artists to Torrance and team them up with Southern California artists groups to work together,” added Max. Some of the other countries and cities Max is reaching out to include Rotterdam, Amsterdam, London, Tokyo, Melbourne, Sydney, Johannesburg, South Africa, Mumbai and Istanbul. Max wants to work with other thriving artists from other countries. Their work, which is rarely seen outside their own country, will be highlighted at the Torrance Art Museum where everyone can come and see their artwork. That is the plan, so let’s do it! Great idea and why not? The Torrance Art Museum presented two exhibitions for the Getty's Pacific Standard Time: LA/LA initiative / SUR Biennial this fall. Both The Cuban Matrix and Yoshua Okon: Oracle garnered attention from various press outlets locally, nationally, and internationally. Here are a few newsworthy highlights from our exhibition!